Urban areas around the country are drying up - are there any easy solutions? When you look at the official U.S. drought monitor map, you immediately see that many American cities may be in the wrong places for long-term water sustainability. In particular, note the presence of "long-term" severe-to-extreme drought conditions across most of Georgia, Texas, Oklahoma, New Mexico and Arizona. By 2020, California will face a shortfall of fresh water as great as the amount that all of its cities and towns together are consuming today. 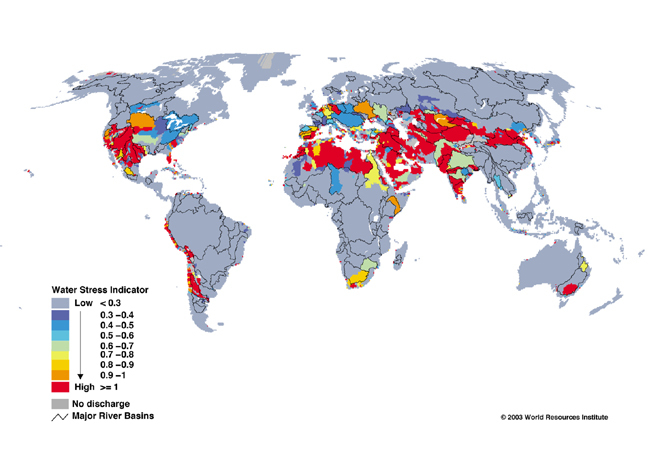 water scarcity, and 65 percent of the world’s population will be water stressed. In the U.S., 21 percent of agricultural irrigation is achieved by pumping groundwater at rates that exceed the water supplies ability to recharge. There are 66 golf courses in Palm Springs. On average, they each consume over a million gallons of water per day. The Ogalala aquifer, which stretches across 8 states and accounts for 40 percent of water used in Texas, will decline in volume by a staggering 52 percent between 2010 and 2060. Texans are probably pumping the Ogallala at about six times the rate of recharge. With increasing rises in the temperature of the earth’s surface and atmosphere, this problem seems only likely to get worse. The geographic details may shift from one season to another, but the long-range trend is toward further diminishing of our sources of water. A major problem with so many environmental issues, including this one, is that the damage occurs slowly, so that people are lulled into gradually accepting additional increments of deteriorating conditions without alarm. But that doesn't change the facts. This is not going to be a post that pretends to have all the answers, many of which are going to have to come from agriculture, which is outside my expertise. But I’ll offer a few thoughts about some answers that must also come from how we grow our cities. In Atlanta, the nation's most rapidly sprawling metropolitan area, recent sprawl development sends an additional 57 billion to 133 billion gallons of polluted runoff into streams and rivers each year. This water would have otherwise filtered through the soil to recharge aquifers and provide underground flows to rivers, streams and lakes. Greater average density also means less irrigated urban land per household. In addition, I’ve been arguing for some time that "green buildings" aren’t really green if they contribute to sprawl, and that "smart growth" isn’t really smart unless it includes green buildings and infrastructure. Doesn’t the presence of long-term drought conditions argue even more strongly for the notion that smart growth should include water-efficient technology and green infrastructure to filter rainwater before it becomes runoff? Finally, could this be another argument in favor of reviving, rather than abandoning, our Rust Belt cities in order to take growth pressure off the Sun Belt?